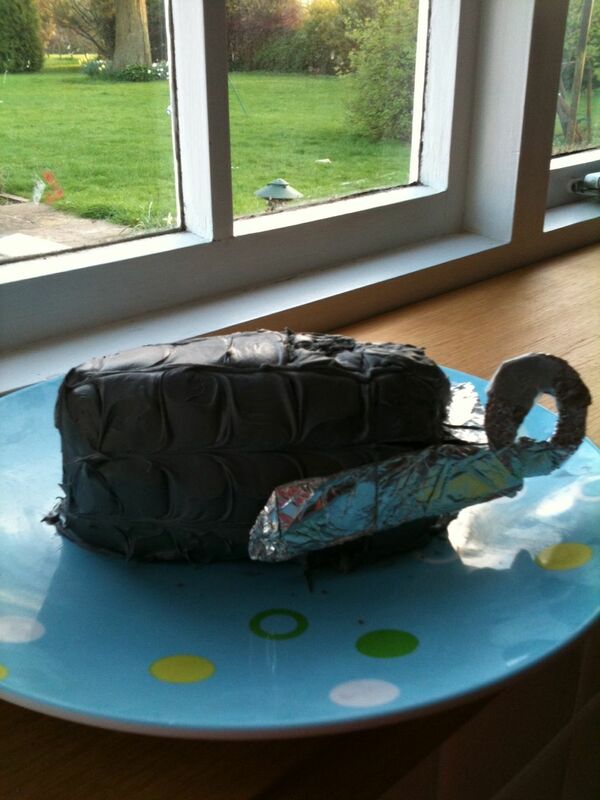 So, middle Hippy comes home from school and tells me that he has to take a cake in for his history project. “Surely you mean food tech” (it’s what they call it nowadays – I don’t know what is wrong with home economics myself, but hey ho) “NO MUM” says hormonal 13-year old (everything is shouted these days) “HISTORY! 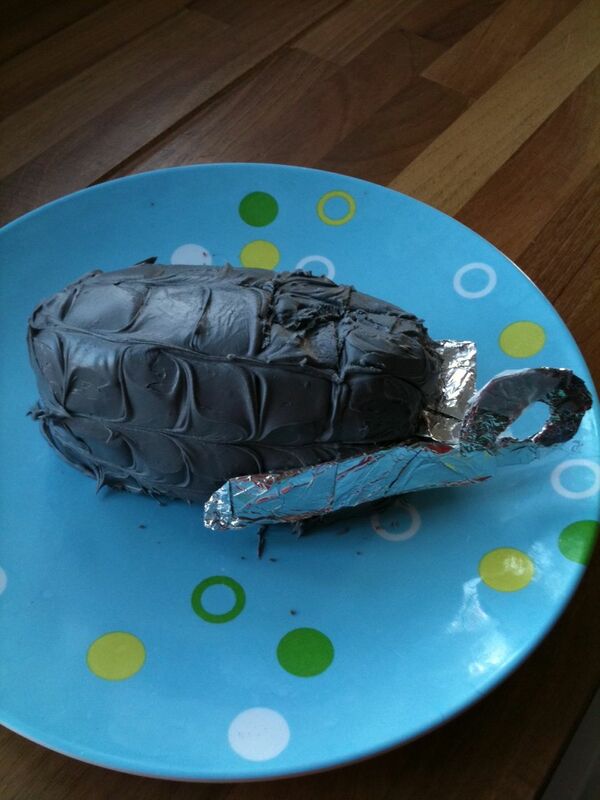 We have to take an element from World War I and make it out of cake. I thought you (note the you bit of this sentence) could make me a trench! Now call me old fashioned but I thought that history was all about learning the order of Henry VIII’s wives, or what happened at Agincourt and don’t get me wrong, I am all for learning about the World Wars – but CAKE? I can only assume that this is a ruse by the (obviously very thin) history teacher to get a nice slice of trench to go with their morning cuppa in the staff room! “I can’t make a trench – it would look like a huge lump of chocolate gloop on the plate. Isn’t there something else you could have instead?” After much SHOUTING we disregarded guns, aeroplanes, soldiers and the like due to the level of skill involved (and the time available) and settled instead for a hand grenade. Nice! So after a busy day at work, sewing and standing on my feet for six hours, I high-tailed it off to the local shop to see what I could see. My original idea was to make two chocolate muffins, stick them together and then cover them in ready rolled icing, but as there was none of this in the shop I was a bit stuck. Luckily I saw my good friend Mrs D who, when invited to comment on my dilemma, sent me to buy Battenburg, gloopy frosting in a pot (I didn’t know such things existed and was extremely revolted to know that you can keep it for up to 30 days in the fridge) and told me to stop moaning and get on with it. I also bought black food colouring (I won’t even go into the ingredients in that), but Middle Hippy is under strict instructions not to put any of this in his mouth! I am publishing a photo of my masterpiece (this is said totally with tongue in cheek as it looks a complete disaster) and I apologise to all of you amazing crafty cake bakers out there who would have done a much better job than I. 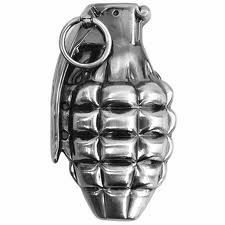 At the same time I am publishing a photograph of a real hand grenade so you can see what it should look like. A Tidy Mind is a Tidy …..